Pinto beans are an inexpensive, versatile bean commonly used in soups, stews, and rice dishes. According to several sources, pinto beans are the most widely used bean in the United States. The legume is also commonly used in Mexican cooking. Many Tex-Mex cooks mash the cooked beans and serve them as frijoles or refried beans. The versatility and health benefits of pinto beans make them an easy and smart addition to your diet. Pinto beans provide a healthy dose of complex carbohydrates. There are nearly 30 grams of starch in a single serving of pinto beans. Carbohydrates in the form of starch provide the body with quick energy. You'll also benefit from 15 grams of fiber when you consume a cup of pinto beans. Fiber helps to stabilize blood sugar, boost satiety, and improve digestive health. Pinto beans provide less than one gram of naturally-occurring sugar. Pinto beans have a glycemic index (GI) of about 39. As a reference, foods with a GI of 55 or below are considered low glycemic foods. The glycemic load of pinto beans is just 15. Glycemic load takes the serving size of a food into account when estimating the food's effect on blood sugar. A glycemic load of less than 10 is thought to have little effect on blood glucose response. There is only one gram of fat in pinto beans, which makes them a naturally low-free food. While some nutrition experts caution against the use of low-fat foods for weight loss or healthy weight maintenance, they generally refer to foods that have had fat removed in processing. Foods like pinto beans that naturally provide good nutrition and little to no fat are a smart addition to any diet. However, be advised that many processed forms of pinto beans contain fat. For example, if you buy canned refried beans or frijoles, it is likely that the beans have been cooked with fat—often lard. For example, a single half-cup serving of organic traditional refried beans provides three grams of fat. Many brands also make fat-free refried beans that are cooked without lard or oil. Each serving of pinto beans provides a healthy 15 grams of protein. For this reason, many vegans and vegetarians use pinto beans or other types of legumes to boost their protein intake. However, pinto beans are not considered a complete protein. Complete proteins provide all of the essential amino acids that cannot be made by the body and therefore must be consumed in the diet. You'll need to combine pinto beans with a whole grain or with seeds in order to get all essential amino acids at mealtime. Pinto beans are packed with nutrients. You'll get 74 percent of your daily recommended intake of folate (294 mcg) if you consume one cup of pinto beans and you follow a 2000-calorie per day diet. Folate, a B vitamin, helps boost red blood cell production and provides other health benefits. You'll also get 25 percent (251 mg) of your recommended daily intake of phosphorus, and 39 percent (0.8 mg) of your recommended intake of manganese, a vitamin that boosts nervous system and brain health. 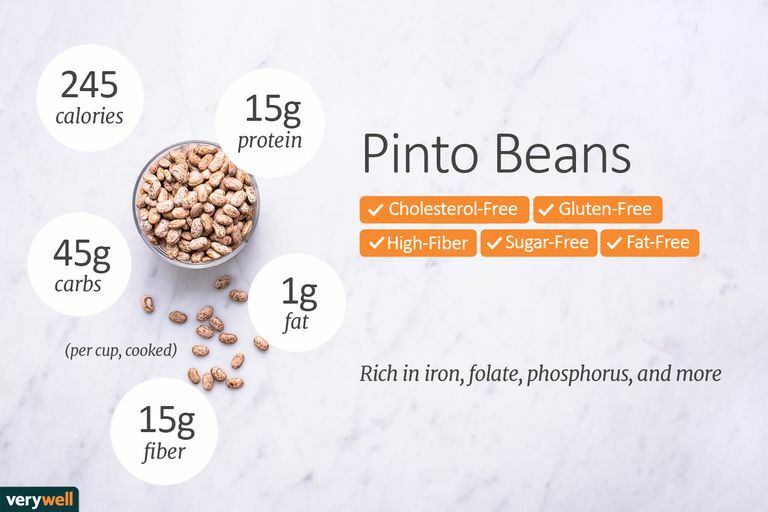 A one-cup serving of pinto beans provides 20 percent (3.6 mg) of your recommended intake of iron, 21 percent (85.5 mg) of your daily intake of magnesium, 20 percent (0.4 mg) of your recommended intake of vitamin B6, 22 percent (0.3 mg) of your daily intake of thiamin, and about 20 percent of your daily intake of potassium and copper. Legumes, like pinto beans, have been studied by nutrition researchers for years because the food is commonly consumed around the world. Research suggests that increasing your intake of beans provides certain health benefits. An evaluation of the nutritional value of legumes published in Obesity Reviews determined that "replacing energy-dense foods with legumes has been shown to have beneficial effects on the prevention and management of obesity and related disorders, such as cardiovascular disease, diabetes, and the metabolic syndrome." Study authors suggest replacing high-calorie, high-fat meaty foods (such as burgers and sausage) with beans or combining meat with legumes in the production of those foods to reduce fat and calorie content. A review published by the Canadian Medical Association Journal found that including beans in your diet helps to lower LDL cholesterol (also called "bad" cholesterol). Another review of studies found that increasing intake of beans, peas, lentils can help both diabetic and non-diabetic patients improve long-term glycemic control in their diets. What should I look for when purchasing pinto beans? When you buy any legumes, look for uncracked beans that have not been exposed to dust or moisture. You can buy beans in pre-packed containers (like bags or boxes), but many stores also sell pinto beans in the bulk section so you can buy only the amount that you need. You can also purchase canned pinto beans either whole or refried. Many popular Mexican food makers make refried beans in different varieties. If you are watching your fat intake or your sodium intake, check the nutrition facts label before you buy. Salt and fat are commonly used to make frijoles. How do I store pinto beans and how long will they stay fresh? Store beans in an air-tight container in your pantry or in another cool dark place. If stored properly, lentils should stay good for up to 12 months. If you cook pinto beans they will stay fresh for about three days when refrigerated in an airtight container. How should I cook pinto beans? Before cooking pinto beans, you should rinse them to remove any dirt or dust. Remove any cracked or broken beans. Boil three cups of water and add one cup of beans. Simmer for roughly 20 minutes, although cooking time will depend on your taste preference. You don't need a pinto beans recipe to make the most of this healthy food. If you have a favorite soup, stew, or salad recipe, simply toss in a handful of the beans to add flavor and nutrition. If you have a pinto beans recipe and you are out of the beans, it is easy to substitute red beans or kidney beans. If you enjoy refried or whole cooked pinto beans, try making your own frijoles de olla (pot of pinto beans) at home—rather than buying canned beans—to reduce your salt and fat intake. Once the pinto beans are cooked, add them to a frying pan to make refried beans. Place all ingredients into a large pot filled with water. Bring to a boil and simmer until beans are soft, 60-90 minutes. Drain and season to taste. If you want to make refried beans, place a heavy skillet over medium heat and add one tablespoon of canola oil. You can also add additional garlic at this time if you prefer the taste. Add several cups of beans and cook for 5-7 minutes until thoroughly heated. Smash with a potato masher. Add spices such as chili powder or cumin to taste. Salt according to your preference. When you don't have time to make pinto beans on the stove top, consider making easy slow cooker pinto beans instead. According to the American Academy of Allergy, Asthma, and Immunology, legume allergies were assumed to be rare in the past, but are now more commonly recognized in adults and children. The source notes that in-office allergy testing may be able to reveal a sensitivity to certain beans, but that an oral challenge is the only way to know for sure if you are allergic to pinto beans. Symptoms of a legume allergy may include swelling in the face, difficulty breathing, severe asthma, abdominal pain, nausea, or vomiting, according to the Anaphylaxis Campaign, an allergy support network based in England. If you suspect that you have an allergy to pinto beans or any legume, speak with your healthcare provider to get a proper diagnosis. Compounds that interfere with nutrient absorption are commonly referred to as "antinutrients." However, the term is misleading because all plants contain these nutrients, which have an effect only when consumed in extremely large quantities. The effects of these nutrients are negligible at the quantities you likely consume in pinto beans. In addition, even though some consumers are concerned about antinutrients in grains and legumes, the substances are inactivated by appropriate soaking and cooking of the beans. So, unless you have a condition that may be impacted by these nutrients (such as iron-deficiency anemia) you shouldn't worry about them too much. How Healthy Are Black Beans?